Americans think the U.S. health care system is in need of major repairs, according to a CBS News/New York Times poll. Nine out of 10 say the system needs at least fundamental changes, including 36 percent who favor a complete overhaul. Although most Americans say they are generally satisfied with the quality of their own health care, including 41 percent who say they are very satisfied, it's a different story when it comes to the cost of care. Just one in five are very satisfied with what they pay for health care, while a majority (52 percent) are dissatisfied, including a third who are very dissatisfied. Americans are even more critical of health care costs in the nation as whole: 59 percent are very dissatisfied with the overall cost of health care in the U.S. and another 22 percent are somewhat dissatisfied. Most Americans believe government can play a role in fixing the health care system. Two-thirds say the federal government should guarantee that all Americans have health insurance — and a similar number says providing health insurance for all is a more serious problem than keeping health care costs down. Eighty-four percent of Americans favor expanding government programs in order to give health insurance to all uninsured children. Less than one in three, however, say the government would do a better job than private insurance companies at actually providing medical coverage. 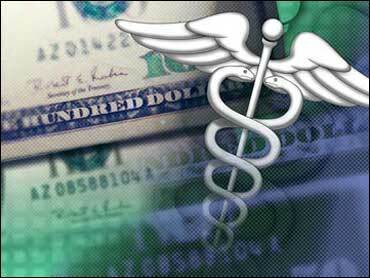 Forty-four percent said the government would be worse as a health care provider than private companies. SHOULD GOVERNMENT GUARANTEE HEALTH INSURANCE FOR ALL? More Americans do think the government can do a better job than private companies at helping hold down health care costs. Health care promises to be a crucial issue in the 2008 presidential campaign. In a CBS News poll conducted last month, health care tied with jobs and the economy as the second-most important issue facing the country, following the war in Iraq. It was even more important to Democratic primary voters, ranking ahead of the economy and jobs. In the new poll, the public gives the Democrats a big edge over the Republicans on handling health care issues. Asked which party they believe will best improve the health care system, 62 percent said the Democrats, while just 19 percent said the Republicans. However, none of the top tier of Democratic presidential candidates has yet to gain a significant national edge on the health care issue. Six in ten Democratic voters expressed confidence in Sen. Hillary Clinton's approach to health care, but more than half of voters nationally said they're uneasy. Voters overall were also more uneasy than confident about both Sen. Barack Obama and former Sen. John Edwards on health care. But all three Democratic presidential hopefuls rated higher than the current president on the health care issue. Only 17 percent of Americans said they were confident in President Bush's approach to health care, while 77 percent — including about half of Republicans — were uneasy. Asked to choose which health care topics they'd like to hear the 2008 presidential candidates talk about over the next two years, 34 percent said providing coverage for the uninsured was most important, followed by 28 percent who said reducing health care costs. Eighteen percent said improving the quality of care and a similar number said improving the Medicare prescription drug benefit. This poll was conducted among a random sample of 1,281 adults nationwide, interviewed by telephone Feb. 23-27, 2007. The error due to sampling for results based on the entire sample could be plus or minus three percentage points. The error for subgroups is higher.